On 5 November 1991, Walter Massey, the Director of the National Science Foundation (NSF), dedicated the Albert P. Crary Science and Engineering Laboratory, the new $23-million McMurdo Station science laboratory, which began limited operation for the 1991-1992 austral summer. The center will primarily support NSF-funded investigators and provide much needed laboratory space, analytical instrumentation, and staging areas for a variety of scientific disciplines. The facility will replace the station's old, outdated science buildings, some of which were built as early as 1959. More than 16,000 kilometers from the United States at McMurdo Station, distinguished visitors, scientists, and support personnel celebrated the beginning of a new era for Antarctic science on 5 November 1991, as Walter Massey, Director of the National Science Foundation (NSF), dedicated Antarctica's first modern research center. NSF, which funds and manages the U.S. research program in Antarctica, anticipates that the new science and engineering center will improve scientific understanding of this remote region by bringing advanced technology to scientists working there. Dr. Massey told those assembled for the ceremony that the "new lab and its highly sophisticated scientific equipment will enable the Nation's scientists to do research procedures not formerly feasible in Antarctica." The state-of-the-art equipment housed in the $23-million laboratory will help scientists to learn more about Antarctica's role in global change. From this site, Dr. Massey said, "We will learn more about the ozone hole, its effect on antarctic life forms, and the role of ice sheets in global change." Joining Dr. Massey at the ceremony were the U.S. Ambassador to New Zealand, Della M. Newman; the Director of the National Oceanic and Atmospheric Administration, John A. Knauss; the Director of the U.S. Geological Survey, Dallas L. Peck; and E.U. Curtis Bohlen, the head of the U.S. delegation to the recently completed negotiations for the Environmental Protocol to the Antarctic Treaty. The 46,500-square-foot laboratory, construction of which began in 1987, is named for Albert P. Crary, a geophysicist and glaciologist who served as chief scientist for the U.S. Antarctic Program in the years following the International Geophysical Year. When completed, the center will consist of five "pods," which will provide such facilities as laboratories, office space, storage, computer facilities, and meeting rooms. Phase I of the structure, which contains a two-story core pod and the biology pod, began limited operations during the 1991-1992 austral summer. Its first occupants were environmental researchers from Oak Ridge National Laboratories, Montana State University biologists, and University of Alaska ocean scientists. Full operation of Phases I and II, which houses the earth sciences pod and the atmospheric pod, are scheduled for November 1992. The final phase, Phase III, will contain an aquarium and a dive locker. NSF plans to have this section completed by January 1993. McMurdo's older biology and geology laboratories (Eklund Biological Center and Thiel Earth Science Laboratory) will be phased out gradually beginning in early 1992. Besides supporting scientists funded by NSF, the center will support an Environmental Monitoring and Enforcement Laboratory (EMEL), a Snow and Ice Mechanics Laboratory (SIML), and Antarctic Meteorological Research Center (AMRC). The EMEL will consist of two laboratory areas--one dedicated to sample preparation and environmental analyses and a second equipped for general laboratory procedures. Under the direction of the Cold Regions Research and Engineering Laboratory, research at the SIML will focus on studying and testing the mechanical and engineering properties of snow and ice. Discussions also are underway on the installation of a very-long-base-line interferometry telescope (VLBI) and synthetic-aperture-radar (SAR) ground station. The Albert P. Crary Science and Engineering Center was designed in close collaboration with researchers working in the polar regions. It is intended not only to be a sophisticated, modern laboratory but also to be flexible enough to meet the changing needs of science. NSF also hopes that this new center will facilitate and encourage cooperative research among scientists from other countries. For nearly four decades, McMurdo Station has served as a base to U.S. scientists as they probe the mysteries of the vast antarctic continent and its surrounding seas. The U.S. station, sometimes called the gateway to the antarctic interior, is the most southern sea port in the world and the logistic hub of the U.S. Antarctic Program. The addition of the Crary Center, with its specialized equipment, to the facilities already provided at McMurdo and other U.S. stations will enhance the ability of scientists to go beyond the field collections and observations that have typified earlier research in Antarctica. 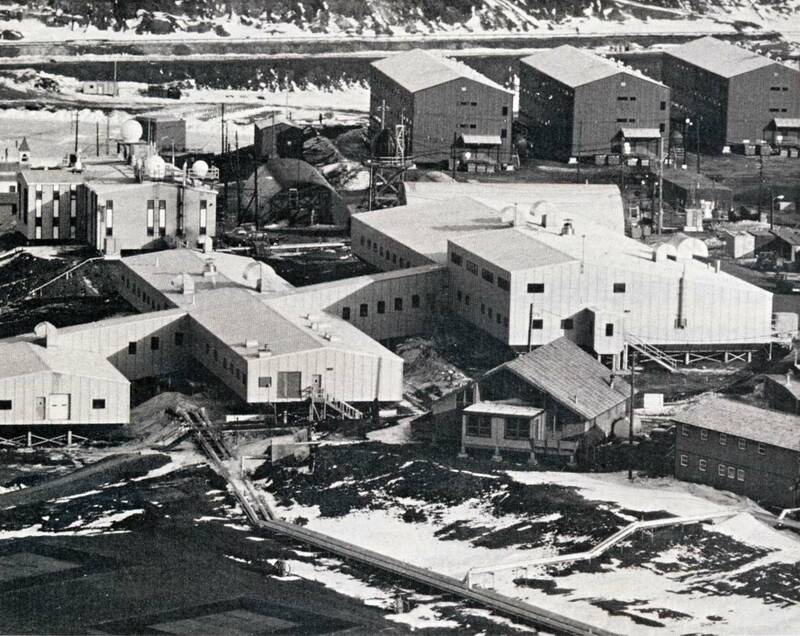 Articles in earlier issues of the Antarctic Journal describe the planning and construction of the laboratory, as well as some of the planned facilities. Readers who are interested in these more detailed descriptions should read "Designing a new science facility for McMurdo Station" by Robert Haehnle in the December 1988 issue (Volume 23, number 4, pages 4-6) (pdf of article) and the September 1991 issue (Volume 26, number 3, page 4). 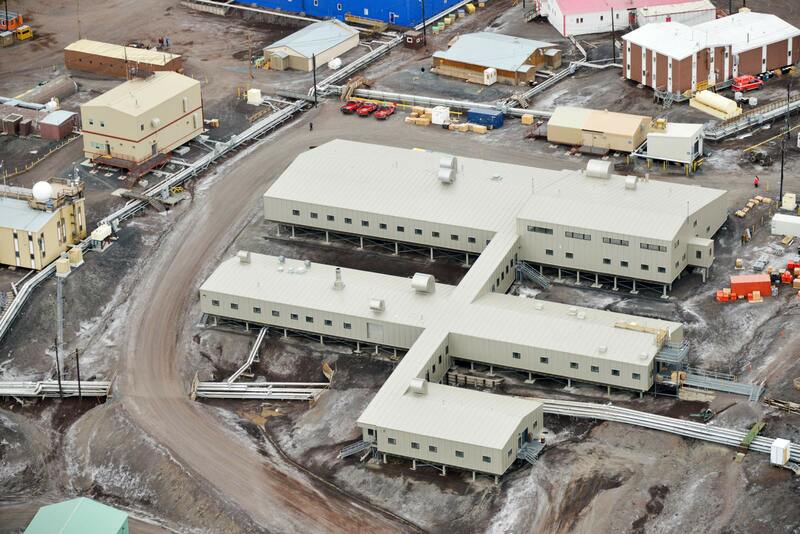 Here's a January 2014 aerial photo of the lab by Reinhart Piuk..a much larger version is available from the source--the Antarctic Photo Library. I have a few of my 1989-90 construction photos here.